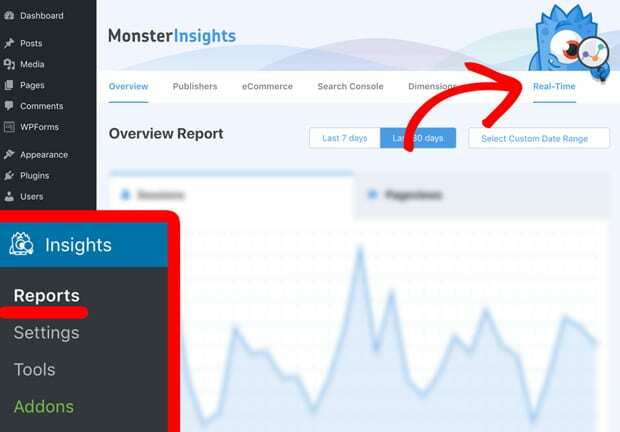 Do you want to know which MonsterInsights dashboard reports you have access to when you use the popular MonsterInsights plugin? 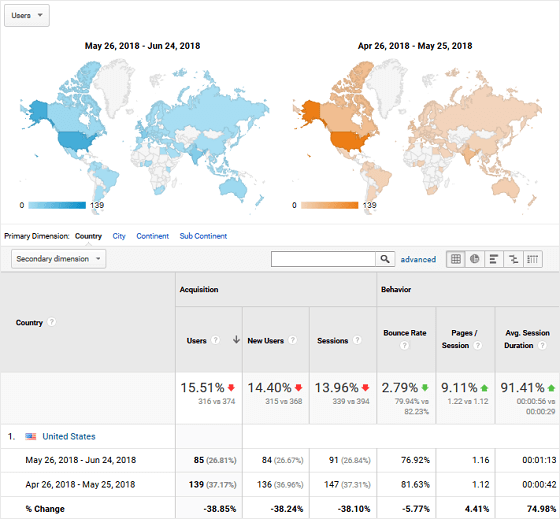 It’s great that connecting your WordPress website to Google Analytics gives you access to plenty of ready-made Google Analytics dashboards to view where your site visitors come from and how they behave once on your website. But MonsterInsights makes things even easier by offering you comprehensive dashboards right in your WordPress admin panel to give you a quick glance at how your site is performing. 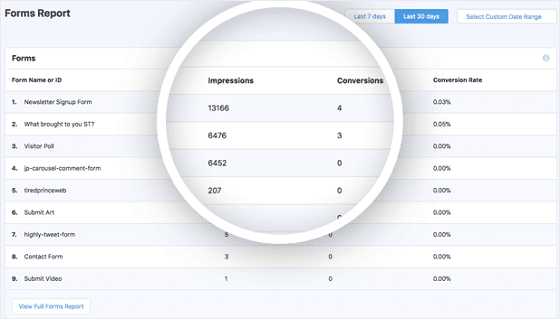 In this article, we’ll show you what you get with each MonsterInsights dashboard report and how each of them help you make data-driven decisions to grow your following, increase your sales, and make your business a success. With MonsterInsights, you can see your Google Analytics data as soon as you log into your WordPress dashboard. It has a dashboard widget which shows your site’s key metrics right on your WordPress dashboard, with no clicks required. By default, it’ll show you a quick summary of your overview report that includes your pageview reports, top content, device breakdown, etc. However, you can add more tabs from the Publishers report as well as the eCommerce report. The Google Analytics Dashboard Widget for MonsterInsights makes it really easy and quick for you to view your website’s important reports. Immediately after signing in, you’ll be able to see any significant changes in your website traffic and take action if required. To access your MonsterInsights dashboard reports in WordPress, go to Insights » Reports. There, you’ll immediately see the Overview Report, as well as the other dashboard reports MonsterInsights has available for you. 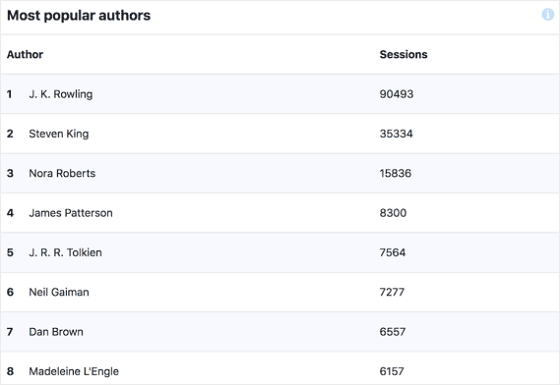 The first part of the Overview Reports gives you a visual look at the number of sessions and page views your site has seen. You can define the data to show the past 7 days or past 30 days. You can also change it to a custom date range if you need to know specific data for a certain time period. Right underneath this section, you’ll see quick data related to your site visitors’ behavior, including the number of sessions initiated on your site, the number of page views, the average session duration, and your site’s overall bounce rate. You will also see a percentage of change, whether up or down, as compared to the time period you have chosen for this report. For example, if you’ve chosen to see the number of sessions and pageviews for the past 30 days, you’ll see this quick data for the previous past 30 days as well. If you keep scrolling down in the Overview Report, you’ll see a simple graph of New vs. Returning Visitors and Device Breakdown. This is a great way to see what percentage of people are returning to your website after leaving. It also shows you which devices are most likely to access your site. Next, you can check out which countries are visiting your site the most. You’ll also see which websites are referring people to your site the most. 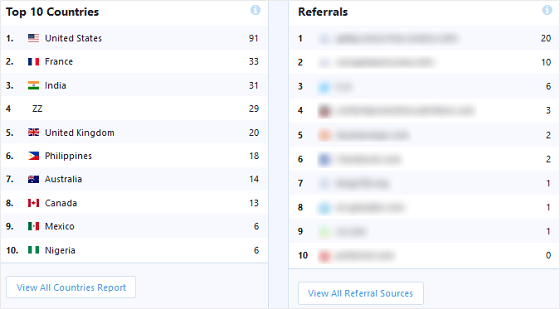 You can click on the View All Countries Report or View All Referral Sources to get a more comprehensive list. When you do this, you’ll be asked to sign into your Google Analytics account. You’ll then be taken to the correct report in Google Analytics to get additional data. You can also define the date range and change the display to reflect goals you’ve set up for your website. 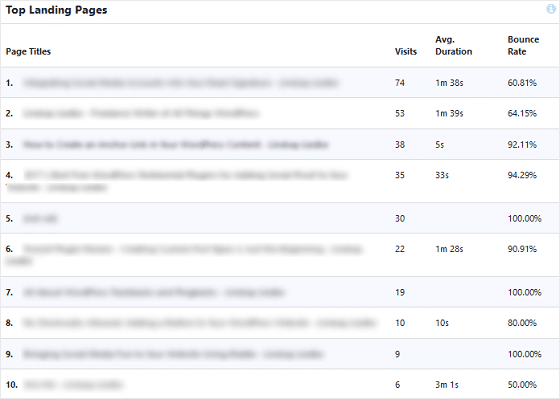 Lastly, the Overview Report shows you which posts and pages are the most popular on your site. This gives you insight to which content your site visitors like the most, so you can give them more of what they want. Again, if you click View Full Post/Page Report you’ll see all your site’s posts and pages in Google Analytics and how they’re performing. Check out the number of pageviews, unique pageviews, average time on page, entrances, bounce rate, and exit percentage. You can also see the value each page is bringing your business. Plus, if you’ve assigned a value to each of your web pages, you can determine their impact on your bottom line. There’s a lot of information here, and though it’s mostly aimed at helping bloggers who have websites that focus on blog content, it actually helps those with eCommerce shops make more money online too. To start, rather than deal with finding demographic and interest reports in Google Analytics, you can see this data right in your WordPress dashboard instead. 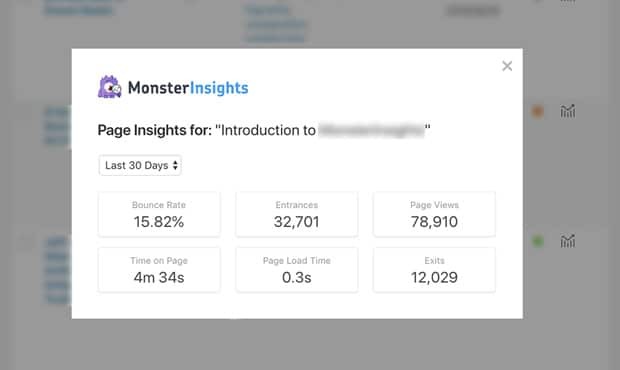 This MonsterInsights dashboard report is also helpful for those who’re trying to create effective landing pages for their website. Whether your value proposition is trying to convince people to subscribe to your newsletter or check out your online shop and make a purchase, knowing which landing pages are the most effective can help you make your business even better and ultimately build a bigger following. If you want more comprehensive data than what the Publishers Report offers, you can always check out our definitive guide to Google Analytics for publishers. 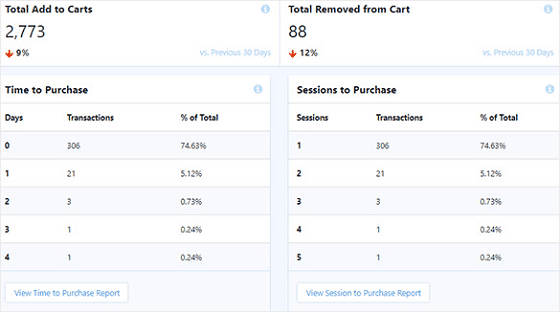 Click on the eCommerce Report tab in MonsterInsights to get a quick glance at how your online shop is doing. To start, you can see data such as your shop’s conversion rate, the number of transactions, how much revenue you’ve generated, and the average order value. Plus, you can make sure you focus your pay-per-click advertisements, whether you use Google Adsense or Google AdWords, on promoting your best-selling products. In the eCommerce Report, you can also check out how many days it took site visitors to make a purchase from your website. This includes the number of transactions that were actually finalized. In addition, see how many sessions it took site visitors to make a purchase. Plus, view how many transactions were finalized, and the total percentage. For help with boosting sales in your eCommerce shop, be sure to check out these 11 smart tactics for reducing shopping cart abandonment. And, if you need more data related to your online shop, find out how to track shopping cart abandonment in Google Analytics. Click on the Search Console Report tab to find out your Top 50 Google Search Terms. You’ll see the number of clicks, impressions, click-through-rate, and average position of each term. If you haven’t already, make sure to check out our step-by-step instructions on how to configure your WordPress site with Google Search Console. Click on the Custom Dimensions Report tab to track custom data you want showing in your MonsterInsights dashboard report. This is perfect for those that feel limited by the data that Google Analytics has when it comes to data tracking. For a detailed look at how to use custom dimensions in Google Analytics, as well as in MonsterInsights, check out this helpful beginner’s guide to custom dimensions. Click on the Forms Report tab to see how your WordPress forms are performing on your website. MonsterInsights is proud to have integrated with the popular contact form plugin, WPForms, so you can see the number of form views and conversions your WordPress forms are getting. It also integrates with other popular form plugins, like Gravity Forms. As a result, you can begin optimizing your WordPress forms to get more conversions. That way you can generate more signups and boost sales in your online shop. For help using the newly-released Forms addon, check out our documentation on getting started with the Forms addon. Click the Real-Time tab to see your users’ activity on real-time. 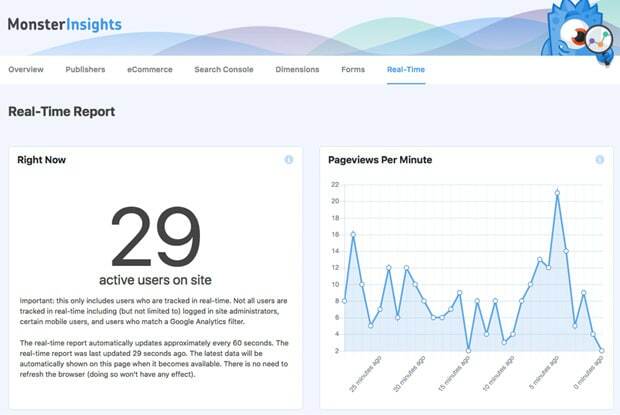 The Real-Time report allows you to monitor your users’ activity on your site at any given time. You can see the number of active users, pageviews per minute for the last 30 minutes, and more. Moreover, you can see top pages, top referral traffic sources, top countries, and top cities your visitors are from at the moment. The Real-Time reports let you see the user interaction on your site right as it’s occurring without having wait until the next day. 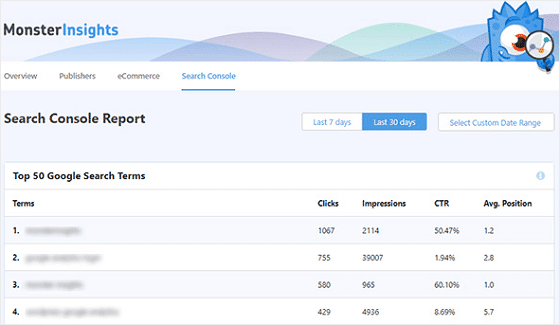 These real-time reports are especially useful if you’ve just launched a special marketing campaign and want to know how people are taking this. For example, you can track your email, social media, and other paid marketing campaigns’ performance right away. 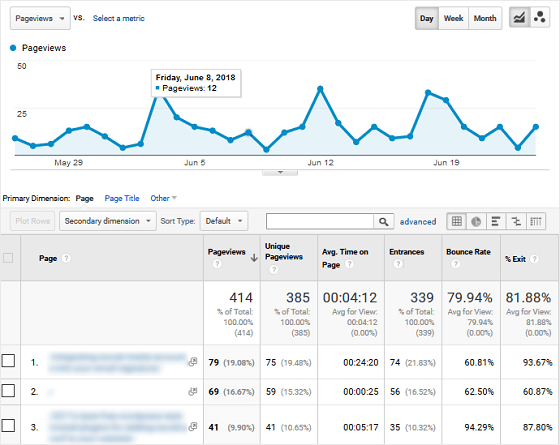 For more details, read our complete guide on how to find and use real-time reports in Google Analytics. With MonsterInsights, you can also check stats for individual posts and pages on your WordPress site. To view stats for your individual posts, you’ll need to visit ‘All Posts’ page by going to Posts » All Posts. Similarly, you can go to ‘All Pages’ page to see stats for your individual pages. 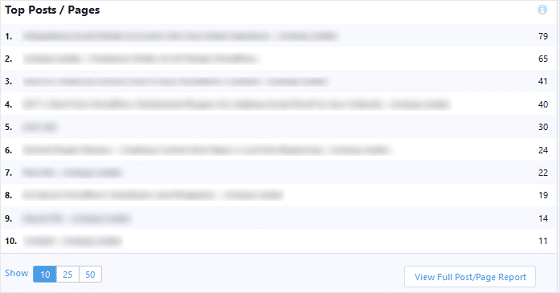 The plugin adds a small ‘Insights’ icon for each of your posts or pages. Simply click the icon to see the stats for the post. Then, a popup window will appear with stats for the respective page or post. For detailed instructions, read our complete guide on how to check stats for individual posts in WordPress. And there you have it! 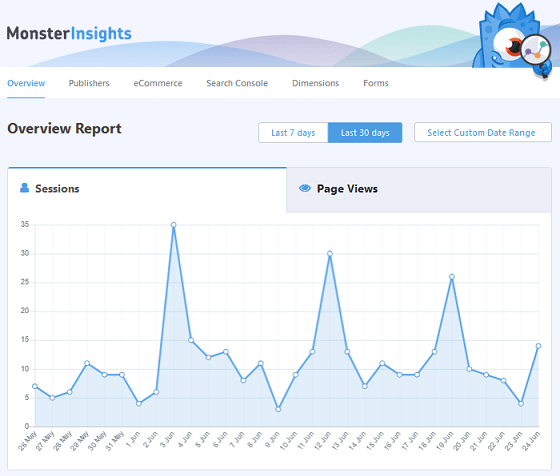 You now know everything there is to know about MonsterInsights dashboard reports. So, what are you waiting for? Get started with the best Google Analytics plugin today so you can see how your site is performing at a glance.